ABLC 2018 wrapped up with the ABLC Wolfpack including James Iademarco from Strategic Avalanche, David Dodds with Dodds & Associates, Ron Cascone from NEXANT, independent consultant Paul Bryan, and Joel Stone from ConVergince. While they didn’t howl at the moon, they were voracious, vicious wolves analyzing 8 major projects with points and counter-points, otherwise known as pros and cons. 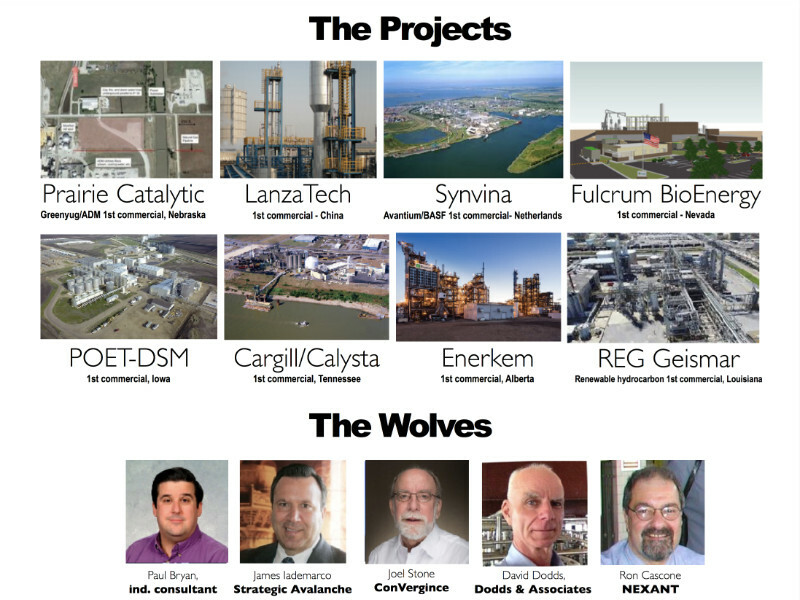 The projects included Prairie Catalytic Greenyug/ADM in Nebraska, LanzaTech in China, Synvina in Netherlands, Fulcrum BioEnergy in Nevada, POET-DSM in Iowa, Cargill/Calysta in Tennessee, Enerkem in Alberta, and REG Geismar in Louisiana. The following slides were presented as an overview of the eight technologies and their progress and promise at ABLC 2018 in Washington DC.